Continuing west we came to the town of Winters (dominated by the Mariani Nut Company) and two old bridges across Putah Creek. The Winters Road Bridge (23C0243) is another closed spandrel arch, but unlike yesterday's bridge, this is a three span bridge supported on hexagonal piers. It's 447 ft long, with a 123 ft long main span, and only 24 ft wide. 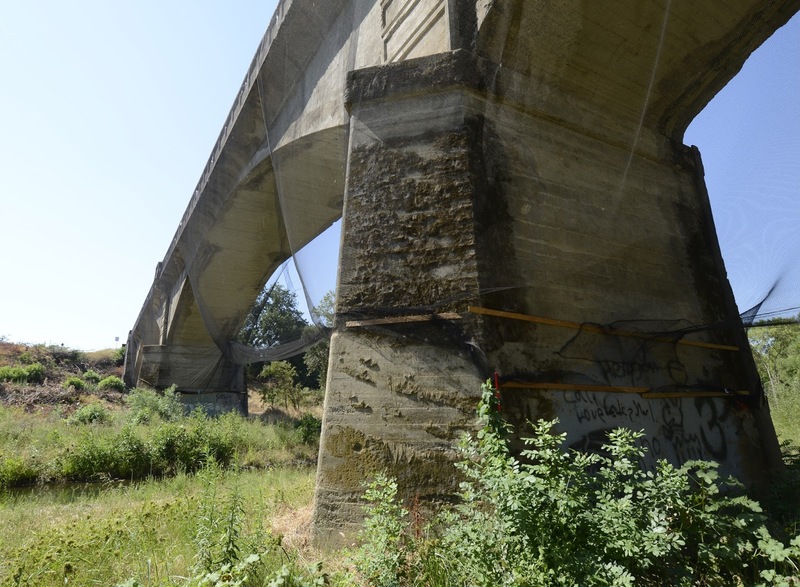 It's a road bridge that was built in 1907 making it the oldest bridge in Yolo County and eligible for the National Register. I made a composite picture in Photoshop because the bridge was too big for me to capture in one shot, even with my 12mm lens. For some reason the've covered the underside with netting, probably to keep away the swallows, although I never heard of swallows being a danger to anything except insects. Maybe the swallow nests can damage such an old bridge? Yolo County, California Bridges: Winters Road Bridge across Putah Creek (1) by Mark Yashinsky is licensed under a Creative Commons Attribution-NonCommercial-ShareAlike 3.0 United States License.